Hey Guys, Physical activities/Exercises are most important things for living a healthier life. so we’re going to discussed the benefits of Cycling on Health. There are many benefits of cycling that directly effects on our health. The research show that if a person do cycling on regular basis his/her health is better than a person who do not have any activity in daily routine. 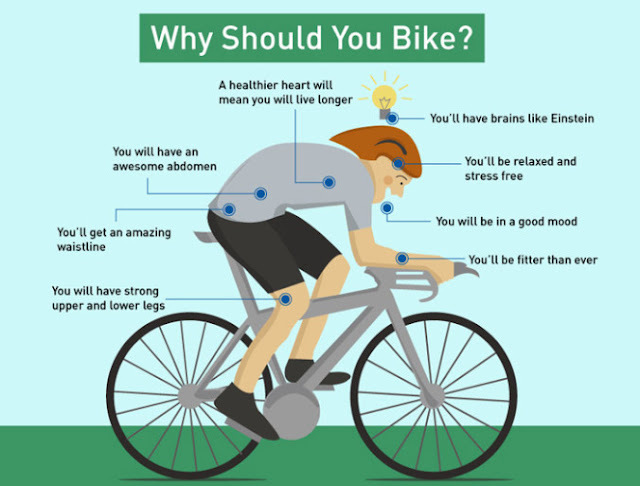 The health benefits of regular cycling includes, increased cardiovascular fitness, increased muscle strength and flexibility, improved joint movement, decreased stress, improved posture and coordination, strengthened bones, decreased body fat levels, prevention or management of disease and reduced anxiety and depression. Cycling comes in Aerobic Exercise, is any physical activity that uses large group muscle and causes the body to use more oxygen than it would while resting. Cardiovascular System: The cycling reduces the risk of stroke (A major killer) and coronary heart diseases. Regular exercise on a static cycle machine in patients with heart failure improves cardiac Function. Cycling strengthens our heart muscle, this improves our heart’s ability to pump blood to our lunges and throughout the body. Muscle and bones Strength: Cycling also improves muscle and bones strengths. Cycling is a non-weight bearing activity and regular cycling leads to improved muscle strength and improved mobility and coordination. Body fats level: cycling also help to reduces the body fats level. As a result, it’s easy to get injured, and that risk is increased the heavier you are. Cycling, by contrast, is low impact. As well as being a cardiovascular exercise that burns calories and reduces your body fats. Improve sleep: exercise generally improves Sleep for most people, and help sleep disorders such as insomnia. The optimum time to exercise may be 4 to 8 hours before bedtime, though exercise at any time of day is beneficial, with the possible exception of heavy exercise taken shortly before bedtime, which may disturb sleep. There is, in any case, insufficient evidence to draw detailed conclusions about the relationship between exercise and sleep. According to a 2005 study, exercise is the most recommended alternative to sleeping pills for resolving insomnia. Sleeping pills are more costly than to make time for a daily routine of staying fit, and may have dangerous side effects in the long run. Exercise can be a healthy, safe and inexpensive way to achieve more and better sleep. Reduced Anxiety and Depression: it also helps to reduce the anxiety and depression.